About a month ago, J and I were browsing through a local kitchen store and happened upon the Vitamix blenders. We’d first heard of the Vitamix reading Thomas Keller’s “Ad Hoc at Home” cookbook where it’s used in several recipes. I found it odd at first, then telling, that Keller continually referred to it by its brand name. No instructions were given that required the use of a “blender.” After researching its capabilities, I was impressed. So we wanted to see one in person. The salespeople at the kitchen store had practically granted the Vitamix deity-like status. The floor model glowed with an imagined golden nimbus as the clerk recounted its otherworldly capabilities: powers through ice like a chain saw, spins with tornado-like force, chews fibrous fruit like a ravenous goat. In fact the Vitamix works with such high-speed intensity that it heats the ingredients in its container, as in makes hot soup out of a frozen smoothie, if you’re not careful. Hot soup in a blender in about five minutes: Sold. The price was steep as a cliff, but we rationalized the purchase by counting it as our next seven birthday gifts, each. We brought it home, and promptly made, of course, frozen margaritas. Not regular frozen margaritas, though. This version had whole fruit. Peel an orange, peel a lime, drop them in — membranes and all — and blend them up with some silver tequila, Cointreau, ice and a touch of water. The Vitamix made short work of ice cubes and blended the whole fruit to a smooth consistency. Whole-fruit fiber hidden in a frozen cocktail? Brilliant! Make mine a double. Place all ingredients in the blender in the order listed. With the blender on variable 1, turn it on. Increase speed to variable 10, and set to high. Blend for 5 to 6 minutes, until steam escapes from the lid. Serve with reserved broccoli florets. Presto, hot, creamy soup. To clean up, fill the container halfway with hot water and a squeeze of dish soap, and run the blender again. Holy molé, the thing cleans itself! Queue the angels: This is one heavenly appliance. All the fixins in the Vitamix. 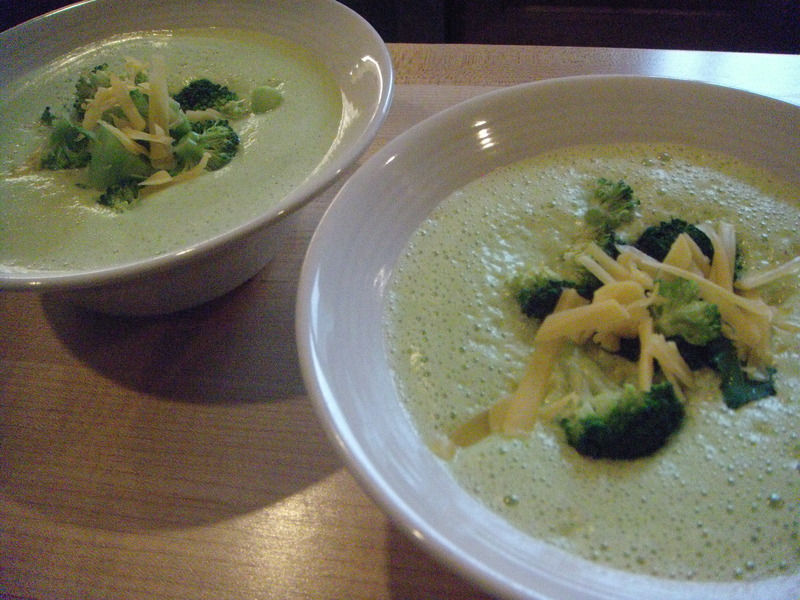 Beautiful broccoli cheddar soup in mere minutes. Really, a Vitamix. I can’t wait to taste the broccoli soup. I can imagine endless ideas of recipes. Keep me posted. Yes! I didn’t think we’d use it as much as we do. Pretty cool tool. Your margaritas were highly recommended! Margaret and I discussed them over her version, watermelon margaritas. They were wonderful. The machine Sounds like a fun addition to the kitchen. Mmm, watermelon margaritas sound incredible! J wanted me to add a disclaimer that he still prefers the classic margaritas, made with fresh lime, silver tequila and Cointreau, shaken with ice and served up, in a martini glass. And I agree, they’re delicious. But you really can’t beat a frozen cocktail on a hot summer evening. Yum!